Daily exercises may seem overwhelming if your interest in art is casual or your life is packed with many responsibilities and other enjoyments. However, not all of these take a great deal of time. The habit of doing something artistic or creative every day can often relieve stress -- in a hard day it can be one small thing to look forward to because most of these do not involve judging your work or letting anyone else judge it. 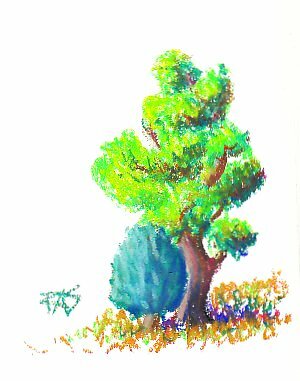 "Tree and Bush Study" above is one of my semi-daily art pieces -- halfway between a sketch and a painting, it's a study that may one day be included in a good landscape, a small experiment in color mixing with Neopastels, a composition experiment using negative space and yet another go at creating plausible vegetation from memory and imagination. Here are some daily exercises in order of difficulty from easiest to toughest. The more of these become regular habits in your life, the faster you'll become a good artist. The first daily exercise I'd suggest for art is just to look at some good paintings every day. You can subscribe to daily painting blogs by serious professional artists, just Google "daily painting" and choose the ones you like the most. Or you may want to look at art museum sites, bookmark them and spend a few minutes every day roaming their collections online. Old Masters, Renaissance geniuses and the entire gamut of art history are easier to find online every day. When you look at great art, it does two things. It educates your eye to understand how great art is done. It also motivates you to try to produce some yourself. Returning to favorites again and again or downloading wallpapers with classical art images will help you study the masters in depth. Even without a demo, if you look at a good drawing or painting every day, you will start to figure out the techniques these masters used -- and when you apply those techniques to something that's in your house, you've just joined the tradition. Difficulty of these daily exercises ranges from expert or serious artist down to things that grade school kids could manage if they got in the habit. What if I said that one of the most important daily exercises you can do is Doodle with any instrument you have at hand on any surface available? Decorating your trash with daily doodles before throwing it out gives your hand a lot of practice making curves, straight lines, swirls, dots and other controlled marks. Sticky notes are even better because you can save any doodles that give you ideas for drawings or paintings. This is the most easy of the daily exercises that I suggest. It doesn't take setting aside time for it so much as being aware of the possibility and making sure some form of pocket doodle materials are handy at some point -- or many points -- during the day. One thing I do to prepare for doodling is to cut art paper including colored art papers to 2 1/2" x 3 1/2" making blanks for ACEOs or ATCs - either Art Cards, Editions and Originals that can be sold online or off, or Artist Trading Cards that are only for trading and collecting. Doodle style ATCs and ACEOs are very popular with collectors. The doodles can also turn into small preliminary studies. If you store them in trading card sleeves, they stay clean and easy to file in an album or your portfolio along with other studies of the same subject. These daily exercises also make convenient small gifts for friends, family and potential art buyers. You can begin to collect art too by swapping with your favorite artists. Gesture drawing is another daily exercise that can be scheduled into the busiest life. The concept of gesture drawing is to look at something -- a photo or a real person, object, scene or animal -- and try to draw it fast, within one to three minutes. Oil pastel is well suited to gesture drawing in color. It's clean, small, dry and affordable. For quick gesture drawings I wouldn't always bother with artist grade oil pastels. All you need is a timer that can be set for one to five minutes, a sketchbook with a lot of pages and some cheap oil pastels. For this daily exercise I'd suggest you use the very cheapest student oil pastels so that you don't worry about "wasting" expensive artist grade supplies on something that will never be finished fine art. The big rule for gesture drawing is to stop when the timer dings. If it isn't finished, leave it and do something else. Schedule your gesture drawing at a time of day when you want a small break and a change of topic to refresh yourself from other tasks. Oil pastels and a small sketchbook could go in your briefcase or bag as something to do every day at work during your break. Or you may prefer to keep your gesture drawing supplies in the kitchen and settle down to this daily exercise while having coffee. It might be something cool to add right before going to bed or after dinner. Choose a time for this daily exercise when you will enjoy it most and some other regular daily activity reminds you that you want to do this. If you keep it up more or less daily for three weeks, it will evolve to a habit you'd miss if you were unable to do it for some reason. Don't worry at all about skipping a day or doing it at a different time, the point of these daily exercises is to create a habit rather than to score points or get graded or anything. Most of all, don't expect gesture drawings to look good or finished. In the long run they will begin to acquire some elegance, a few will sparkle as something gorgeous in themselves in a very simple style. The keepers come along more often the longer you do it but even the greatest artists don't expect every gesture drawing to look good in and of itself. What they become are visual jotted notes that bring back the memory of something you want to draw or paint in more detail. Sketching is a more elaborate daily exercise for improving your skills. Schedule yourself fifteen, twenty or thirty minutes for your sketching session and begin with either good photos to draw from or still life objects that you find easy to render. Using the same inexpensive student grade oil pastels and sketchbook as your gesture drawings, choose one or two objects and draw them more carefully. Shade the shadows and add some basic details, do a sketch that is a rough version of what may become a good painting. Sketches of one small object done in detail can be combined later on into a more elaborate still life. One thing I found useful was to sketch the same thing many times in a row, either changing the angle or trying it with different shading techniques, different effects. If you enjoy watching television, this daily exercise may be just right to fit in between two good shows when there's nothing on that you like. Some artists like to do a sketch session while cooking. If something needs to stay in the oven for half an hour before it's checked, spread out on the kitchen table and do a sketch or two of objects you have in the kitchen. Warm up with a gesture drawing or two and then settle in for a fifteen or twenty minute sketch of the same object. This can add to the accuracy of the sketch and give you more satisfaction with the results. People who take up daily sketching and keep it up even half the time wind up improving their drawing skills at a ferocious rate. Don't beat yourself if you skip a day or even several days. Just pick up where you left off and feel good about any day you do any daily sketching. It's for your own pleasure and growth, no one's going to be grading these preliminary drawings or telling you that you did the assignment badly. Sketching from real things is a powerful method to grow your skills faster than you thought you could. Daily painting is the most advanced of my suggested daily exercises. Many daily painters are already selling art, they post their daily paintings on blogs and websites to keep clients and buyers interested in their works and develop a large readership. I post Semi-Daily Art on my blog, but most times it's not what I would call Daily Painting. Daily painters devote one to several hours a day to producing a complete small painting with a simple subject -- in full depth and layered vibrance, whatever their style is. So I would suggest that if you aren't at that level yet, try to fit in Weekly Painting somewhere on your weekend. Gather up the week's gesture drawings and preliminary sketches. Choose one that you feel came out best or just the one that interests you most. Transfer that sketch onto a good surface and get out your best oil pastels. The key to daily or weekly painting is keeping the size of the finished work down to something that can be completed in one day. Most daily painters online will do 5" x 7" to 9" x 12" paintings, sizes in that range. For a while I did daily ACEO paintings and drawings because I knew even if I got detailed and intense with layered realism, I would still probably finish it in one day. Most daily painters will also set up less complicated subjects -- a landscape with one interesting tree and a mass of background trees, a still life with one to three objects, a face or figure pose -- not a complex painting with several figures, mountains and grass and flowers and trees all in the same scene or the type of still life that has fifteen interesting objects juxtaposed dynamically. Give each project the time and attention it needs to do it well. If you find that your daily paintings are going unfinished, start working smaller or simpler -- or count progress on a painting as Daily Painting. Not all Daily Painters finish their works one per day. Some just post daily stages on Works In Progress to give their readers the pleasure of seeing how the illusion is created. One of the greatest motivators to daily sketching, drawing or painting is to start blogging your results. Go ahead and include exercises done from art books or lessons, studies that aren't complete paintings in themselves, works in progress and anything you think looks remotely cool. People enjoy seeing images and like commenting on them, usually positively. Once you have any skill at rendering the things you see, your images will appeal to readers who like your style. If you join an art community like WetCanvas.com and join in following prompts or just sharing your stuff in a sketch thread, you will get encouragement and valuable critique. Most art communities have rules against flaming that will deter painful personal criticism, so your critiques will usually just consist of suggestions to improve the piece or short explanations of techniques you might be interested in. Feel free to disagree with those suggestions when you do. Many will be surprisingly complimentary even while suggesting something that would improve your work. You can also post your daily exercises to your personal blog or to an image and photo sharing site. Comments won't be filtered by the critique guidelines available in art communities but the topic itself will draw more and more skilled artists and expert collectors to comment on your work. Finally, when you begin selling your work, daily images will attract commissions and keep collectors involved in your progress after they've bought something they loved. The combination of potential sales and social approval wears away any lingering anxiety over whether you're good enough to learn to draw. If you can see what you're doing and move an oil pastel, you're good enough to learn to draw -- and doing something that relates to art every day is a way to become a lot better very fast.